He criticised Christians who go to church every day but then they talk badly about people. 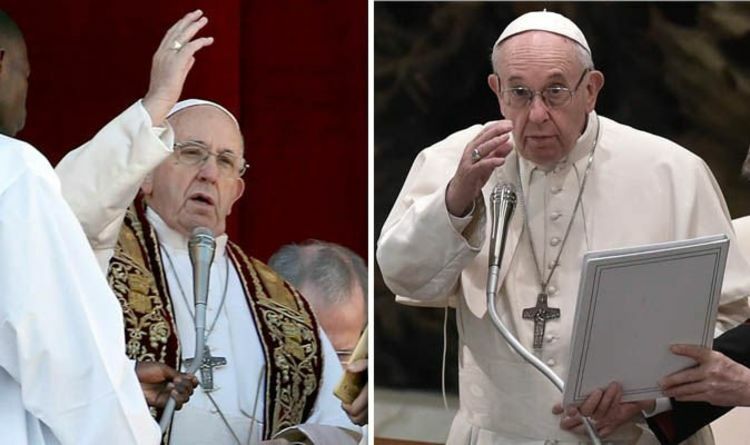 The Pope said: “How many times have we seen those people who go to church, they are there all day, or go every day, and then hate or talk badly about other people, it is a scandal. "It's better not to go to church, live like an atheist; but if you go to church. “Live as a son, as a brother, give a true example." He was referring to the Gospel of Matthew when referring to the “hypocrites” who only pray “to be seen by the people”. The Pope addressed crowds during his weekly prayer to a general audience on Wednesday morning. He added: “Pagans believe that by speaking, they are praying. “I think of many Christians who believe that praying is talking to God, forgive me, but no, praying is done with the heart, from within. "Where there is Gospel, there is revolution. ”It is the revolution of the Gospel, all those capable of love, workers of peace who until then had remained outside history, are builders of the Kingdom of God. "Where there is gospel, there is revolution, the Gospel does not leave us still, it pushes us, it is revolutionary". This is not the first time Pope Francis criticised “hypocritical” Christians in this manner, as reported by CNN. In February 2017, he said during a morning Mass at Casa Santa Marta: “So many Christians are like this, and these people scandalise others. In the Catholic Church, causing a scandal is a great offence. In 2013, the Pope declared that Heaven was open to everyone including the atheists. He said: “The Lord has redeemed all of us with the blood of Christ: all of us, not only Catholics. “‘Father, what about atheists?' Even atheists. Everyone!" "We must do good. 'But father, I'm an atheist!' But do good: we'll all meet there."